Our Spacious rooms are located at all the levels of the building, beautifully designed and decorated with stylish furniture. The rooms can accommodate two persons or they can be used for single use. They feature comfortable King size or twin beds, and spacious bathrooms with white marble. Our spacious triple rooms are located at all the levels of the building, beautifully designed and decorated with stylish furniture. The rooms can accommodate three people. They feature comfortable King size or single beds, and spacious bathrooms with white marble. 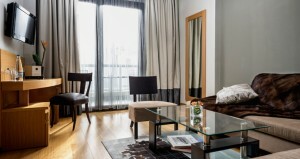 Our Junior Suites are beautifully designed with exceptional quality in mind and decorated with stylish furniture. They feature comfortable King size beds, and spacious bathrooms with white marble. The junior suites are spacious with a comfortable sitting area. They also features a dressing room. Our Deluxe Suites are beautifully and luxury rooms designed with exceptional quality in mind and decorated with stylish furniture. You can choose among a deluxe suite with two spacious bedrooms or a deluxe suite with one bedroom and sitting room. They feature comfortable King size beds and spacious bathrooms with white marble. The Esperos Grand Suite features two separate bedrooms with King-size beds, each with its own independent luxurious bathroom. Ideally located with view to the beautiful lake of Kastoria. The luxurious Esperos Grand Suite offers exquisite decoration based on leather and wooden floors. Also features dressing room and a spacious living room with dining area. It is ideal for those seeking a luxurious stay and is able to satisfy even the most demanding Guests.